Having a proper drainage system on your home for water to run off plays a very important role in the function of your home. For instance, gutter replacement near Ham Lake is often needed after a storm has passed. When you, the home owner, takes a look around and checks for any storm damage aftermath you may notice signs, such as caved in spots near spouts or leaks from your gutter system itself. Sometimes landscapes of rock or mulch begin to washout, even the ground below may begin to give away. Between pools of water sitting near the foundation and puddles blocking the entrance to your home, it may be time to call us here at Refuge Roofing & Siding your professional gutter installation company in Ham Lake. 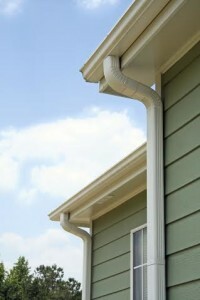 Traditional Gutter System- The traditional gutter system will have joints between the corners of your roof’s edge. Those joints, unfortunately, do cause build up and then blockage in the gutter system where the water runs off to properly drain. These gutter clogs and debris add more weight on your drainage system which can cause major leaks, breakage, and other damages. Seamless Gutter System– Our seamless gutter system installation in Ham Lake will provide your home with a more smooth transition between roof and the ground when it comes to directing water away from your property, landscaping and foundation. Having a seamless drainage system will give your home a more sleek look while keeping water on its route and away from your home’s foundation. Along with our seamless gutter system we offer gutter screens and gutter covers for your new seamless gutter system near Ham Lake! Gutter screens or gutter covers provides the inside of your drainage system more protection. Protection from sticks, leaves, other debris, and even small critters. Granted, having a seamless gutter system is the best of the best, but it still needs protection to even further the life expectancy of the runoff system. Also we provide downspouts on hinges so you may raise them up easily and set them down after mowing the lawn. Overall seamless gutters are cost affordable with a longer life expectancy. Along with the attachments and advancements we have been keeping up with, there is no other drainage system than seamless on the market today. For any questions or estimates from one of our seamless gutter installation professionals around Ham Lake area give us a call (651) PRO-ROOF or contact us here at A Tree Service today!